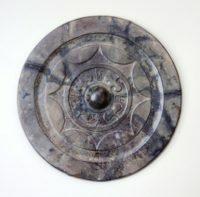 Archaeologists excavating the Nakashima archaeological site in Fukuoka City, Japan, have unearthed an ancient Chinese bronze mirror in exceptional condition. Dating to about 1,000 years ago, the late Yayoi Pottery Culture period (300 B.C.-300 A.D.), the mirror was discovered in Fukuoka’s Hakata Ward. The modern-day city and its environs formed the core of the ancient state of Nakoku or Na, a small kingdom on the island of Kyushu that was governed independently of the state of Wa (the rest of modern-day Japan) from the 1st through the early 3rd century. Nakoku had close ties to the Chinese Han dynasty and for centuries after its demise, most of what was known about Na came from reports in ancient Chinese chronicles. According to a chronicle of the Han Dynasty written by court historians during the Liu Song dynasty (5th century), in 57 A.D. the state of Na sent a high envoy to pay tribute to the Han Emperor Guangwu. In return, the emperor gave the envoy an imperial seal made of solid gold for his king, a version of the jade seals crafted for the emperors themselves. 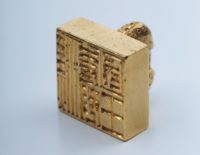 The gold block seal was discovered by farmers on Shikanoshima Island in 1784, confirming for the first time with archaeological evidence the story in the ancient histories. It was inscribed with sublime simplicity making it instantly identifiable: “From the King of] Han, presented to the King of Nakoku.” The seal is now on permanent display at the Fukuoka City Museum and the find site is an archaeological park dedicated to the discovery of the national treasure. The bronze mirror isn’t 95.1% gold and doesn’t have an inscription from the Chinese emperor to King on it, but it is very much a rare and precious thing, thanks largely to how unprecedentedly intact and well-preserved it is. It dates to the first part of the 2nd century A.D., around the time when chroniclers record China and Na were engaged in the slave trade together (107 A.D.). Whether connected to that trade or another, a treasure for a high official bearing tribute or diplomatic gift, this mirror was a luxurious object then and is even more so now that it is an impossibly rare survivor. The mirror was unearthed in April, together with earthenware from sometime around the middle of the late Yayoi period, from a depth of some 2 meters beneath a former village site. The mirror is now on display to the public at the Fukuoka City Museum.